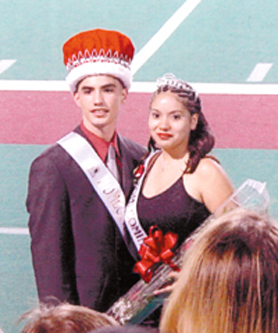 MacArthur High School crowned David Christopher Garcia and Sandra Ibanez the homecoming King and Queen for 2003. The Court included Ashley Sam, Freshman Princess; Kaelecia Feggins, Sophomore Princess; and Natalia Rojas, Junior Princess. The Queen finalists were Kamekia Ellis and Umayra Graza. The King finalists were José Garcia and Don Tré Taylor. King Garcia is 3rd in his class of 510 students, vice president of the chess club, JROTC Cadet Captain, vice president of the Texas Association of Future Educators (TAFE), and a member of the National Honor Society, National Art Honor Society, and Drama Club. Queen Ibanez is a senior class representative, a member of the National Honor Society, Health Occupations Science Association (HOSA), National Art Honor Society, Texas Association of Future Educators (TAFE), and Upward Bound. 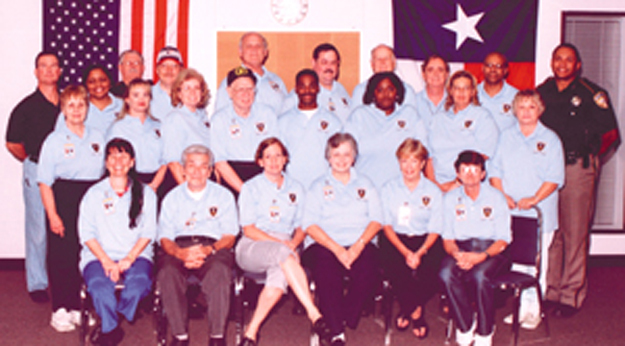 She volunteered at High Meadows Library and Aldine YOUTH for two years. She was also a member of the Freshman dance and pep squad. During the homecoming game, MacArthur beat their opponent Springwood 45-0. ALDINE More than 25 north Houston residents received their bona fides to become the newest members of the Harris County Sheriffs Department Citizens Police team. A ceremony for cadets was held on Thursday, October 17 where new Citizens Police Academy graduates received an address from Sheriffs Captain M.H. Talton and enjoyed a pizza dinner afterward. Also present for the awards ceremony were Captain Susan Nixon, the coordinator and originator of the academy concept, Major Terry Enloe, Commander of the support services, and Deputy P.O. Roy. Sheriffs Deputy Teddy Douthit, who helped train the cadets, said that although graduates of the 13-week course may choose to serve anywhere in Harris County, most stay close to home. The graduation ceremony took place at 7 p.m. in the newly renovated Sheriffs Storefront facility at 5202 Aldine Mail Route. Reopened in September, the Storefront was expanded from approximately 4,000 to more than 7,500 square feet thanks to $278,000 in funding from the Aldine Improvement District. District chairman Clyde Bailey said the board had chosen to fund renovations to give such law-enforcement units the space and opportunity to operate more effectively in Aldine. Were proud of these graduates and look forward to them working out of this new facility to better serve our community, he said. 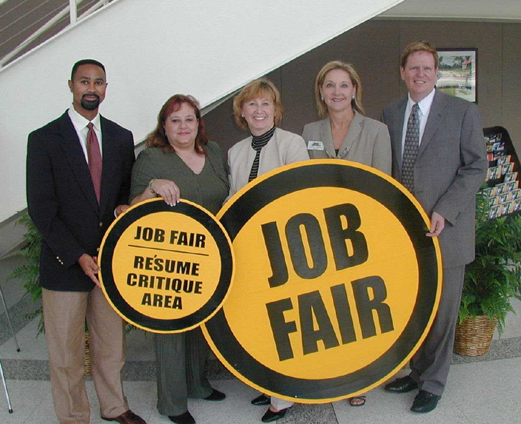 NHG Chamber members and North Harris College staff are preparing for the Greater Houston Job Fair – Wednesday, October 15, 2003 at North Harris College, from 10 a.m. to 3 p.m. Location of the Job Fair is 2700 W. W. Thorne Drive. Left to right : Benny Lambert, Phyllis Oustifine, Christine Pfaff, Marilyn Bayless & Brian Dooley. Everyone is invited, and the event is Free. 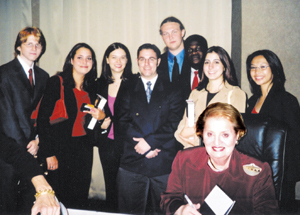 NHC students meet former Secretary of State Madeleine Albright at Oct. 1, Houston World Affairs Council presentation. Shown left to right: Kevin Reilly, Jennifer Leighton, Saskia Anzola, Jeff Bord, Cody Hartgrove-Freile, Jose Calunga, Kara Sweidel, and Lauren Casile with former Secretary of State, Madeleine Albright in foreground. Students at Thompson Elementary school received a big surprise last Tuesday morning when they came to school and saw a big hole in the wall of a first grade classroom. Monday Oct. 6, around 7 PM a suspected drunk driver busted through metal parking lot gates, crossed the large parking lot, hit the principals car, and came to a final stop after hitting the wall of the school. The driver, another adult, and two young children were in the vehicle at the time of the accident. The driver fled the scene and hid in a nearby apartment complex. ALDINE ISD police, with the help of neighborhood witnesses later arrested him. A number of charges are pending. Luckily, there were no children around, said Mike Keeney, Aldine public relations officer. There was one fatality, however. The first graders class pet, a hamster died as a result of the accident. Aldine workers cleaned up the scene Monday night and boarded up the hole. Classes continued the next day with the first grade class moved to an empty pod. 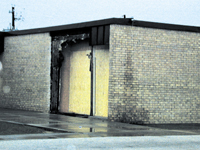 They had a classroom to go to the next morning, Keeney said. The students will remain in the other pod until workers can reconnect wiring in the old classroom. AUSTIN Lawmakers finally arrived at a redistricting map last week, thanks to the extraordinary intervention by a Congressman, Tom DeLay of Sugar Land. DeLay came from Washington, and spent three days in Austin shuttling between Republican factions, in an effort to strike a compromise on how to draw lines around the Midland area to please Rep. Tom Craddick. Republicans under the leadership of Governor Rick Perry, and DeLay, had pressed all summer long for this map, which is expected to deliver additional seats in Congress after the next election to the Republican party. Democrats fought hard to keep the bill from passage, first by walking out of the House and denying a quorum, and later by leaving the Senate in the same manner. Eventually their ranks broke, when Senator John Whitmire returned, and the Republicans could force the issue. However, it seems that the lines on the present map will be challenged by the Democrats, first at the Justice Department to see if it meets the federal Voting Rights Act, and then probably in the courts, where the Democrats feel even more confident that the bill will be judged unconstitutional, because it limits minority voting by obvious gerrymandering. In the Houston area, affected would be districts now held by Congressmen Gene Green, Chris Bell, and Nick Lampson, all Democrats. For Green and Lampson, they have new definitions for their districts that favor minority and Republican voters, and make it harder for reelection. It is expected that Green could carry his district in spite of this, but Lampson may lose, according to most political observers. Bells district has been totally redrawn to favor black voters, but he may still have strength as an incumbent, it is thought. However, many Democrats, led by Garnet Coleman of Houston, have complained that minorities would not really gain any strong voice in Congress as now reconstituted, and prefers the current boundaries. See column in this issue. Local teams were finishing the third of their district games this week, and some of the action was intense. Aldine defeated MacArthur by a score of 21-14 at Thorne stadium. Much of the excitement was left till the fourth quarter, when the Mustangs scored on a punt return of 55 yards by Terrence Aderson coupled with a six yard run by David Brooks for the winning points.. However, earlier the Generals fought valiantly, with a 20 yard pass from QB Anthony Gibson to Juaquin Hampton, followed by a two point to tie the game at 14 all. In Saturdays games, Eisenhower defeated Memorial by a score of 27-21. Nimitz won 20-0 over Spring Woods. Next week they will play Eisenhower, Aldine will play Stratford, and MacArthur will play Forestbrook. In North Forest games, Smiley lost to C.E. King 42-12, and Northbrook continued its losing ways with a blank of 0-35 against Stratford. Northbrook is 1-5 overall, 0-3 district. 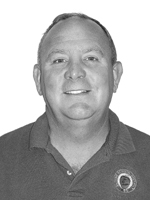 See Mike Keeneys Column for next weeks games. The NFL takes center stage this weekend with the featured game pitting the Denver Broncos against the undefeated Minnesota Vikings. 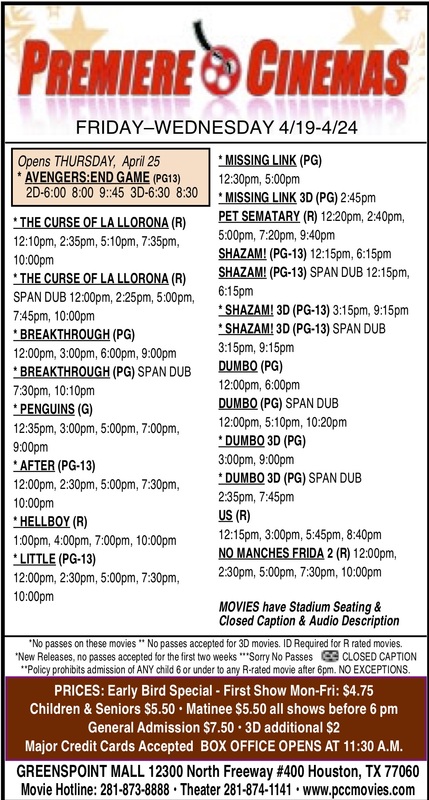 There are a number of other intriguing match ups as well across the land, but before we take a look at whats on tap this weekend, lets review last weeks results. A 9-3 week brought the season record to a very respectable 43-17 (71 percent and rising). Now, on to the games. Now lets take a look at what the college schedule has to offer this weekend. Now lets see what the NFL has to offer this weekend. Big Tex is overlooking the State Fair of Texas, which means one thing, in addition to delicious corny dogs and carnival barkers, its time for the annual Red River bash between Texas and Oklahoma. Is this the year the Longhorns finally get the Sooner monkey off their back, or will OU continue to dominate? Will Texas two athletic quarterbacks, Chance Mock and Vincent Young give the Horns a chance at ending a three-game winning streak, or will the Sooner smash-mouth style of play stop Texas in its tracks for the fourth straight year? The answers to those questions follow, but before we get to that huge game and a number of other intriguing contests this weekend, lets see where we stand at this point in the season. A 7-2 week brought the season record to 34-14, which puts us over the magical 70 percent mark for the season. Now lets take a look at four key college games on tap this weekend. Now lets take a look at what the NFL has to offer this weekend. Carolina at Indianapolis: This game pits two of the leagues most improved teams from a year ago, and both could enter this game undefeated. The Panthers have been getting it done with a bruising running game led by Stephen Davis and an opportunistic and hard-hitting defense. The Colts have been led by quarterback Peyton Manning who turned in a spectacular performance two weeks ago on Sunday night when he blistered the Saints for six touchdown passes in a 55-21 route. Tony Dungy has also built a stout defense, which means the Colts are solid on both sides of the football. NORTHEAST Civility and intelligence hallmarked the performance of the three leading mayoral candidates at the debate held for the North Houston Greenspoint Chamber on Thursday. Moderated by Channel 13s Melanie Lawson, questions were fielded both from her and the audience. Each candidate had an opportunity to present their credentials and positions, answer some questions, and respond to each others comments. The meeting room at the Holiday Inn Airport was packed, and most chamber members seemed to feel they had gotten a good first-hand introduction to the candidates in an important city election. Major issues that were brought up for discussion included traffic congestion, and Metros rail plan and bonding election; the general quality of life in Houston; the efficiency or lack of same in the current city hall government; proposed tax cuts; property valuations; the $2 drainage fee; flooding; health care services; crime; the DNA lab; the poor operation of the Citys 9-1-1 dispatch center; job availability and growth; and pay raises for public officials. Many of the candidates positions are well-known by this time, but audience members got an opportunity to sense the personal commitment and understanding that each candidate would bring to the issues. All three said they were in favor of rail transit, for instance, but only oneTurnerwould support the current proposal by Metro. Although flawed, he said, it is a step in the right direction. He pointed out that other cities in the U.S. are getting transit dollars, and we are losing millions to them. Both Sanchez and White said that they favored some rail system, but not the one that Metro has put on the ballot. They questioned the budgeting figures that have been presented. On traffic, Bill White said that he considers this the number one problem for Houston. He stressed that congestion affects our ability to grow, and said that his 43 point plan, which is available to see on his web site, would reduce commute time by 10%. Sanchez said his plan was common sense, not permiting contractors to tear up roads, letting police clear roads of accidents, and so on. On taxes, the candidates took different approaches. White said after a cut, we need better fiscal management and tax relief for seniors. Sanchez wanted a tax cut, and to raise the exemption for seniors. Turner said NO to a tax cut, because the question then becomes, where do you cut the budget for services? Turner stated that flood or drainage relief should be a basic core service of the city, not financed by an added fee. Sanchez agreed, and said flood control needs to be a city priority, as it is in the county. Whites position was that we would pay for flood relief by refinancing city debt, much as in private business. On Taxes, Sanches pointed out that we have had an 89% increase in our tax bill in the last 6 years, and spending at City Hall is out of control. He would support a tax cap, and cut the city budget. Turner said he wanted performance based budgeting, or so-called zero-based budgets, where each department must justify their expenditures each year, or get nothing. Turner said that Houston needs more federally funded health clinics, that Houston had 3 while Chicago had about 40. All the candidates cited the problem of low immunization rates in Houston and Texas as a major problem. Sanchez and White both thought the health care problem could be solved better if the City and the County worked together on clinics and health services. On Crime, White said that public safety should be the number one priority of city government. Turner and Sanchez pointed out the problem that is imminent of large numbers of parolees about to be released, and the need to work with the state to minimize the impact on crime in the city. In closing, Melanie Lawson pointed out the ethnicity of each candidate, and how Houston can accept and thrive from a population that is diverse. Each candidate agreed, and thanked the Chamber for the opportunity to present their ideas.